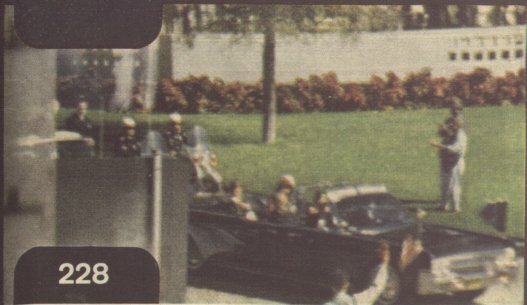 News clip Includes clip from Nix film opposite Zapruder. Reporter: Did you shoot the President? - - OSWALD: AWW I DIDN'T SHOOT ANYBODY, NO SIR. Real Video. 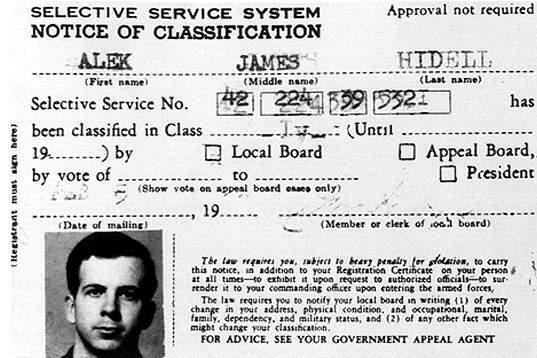 1917 May 29th - Born, Brookline, Massachusets. 1935 - Graduated Choate School, Connecticut. 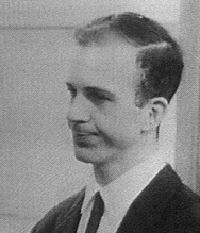 1940 - Graduated Harvard University. 1940 - Wrote book: Why England Slept. The investigations of the last month in America have shown that we are in no position to criticize blindly. It was a great shock to America to wake up one morning in May and find that her supposedly invulnerable position between two, large oceans was invulnerable no longer. America's armored position showed a startling similarity to England's after Munich. Like England, we had less than one hundred modern planes. Like England, we had few antiaircraft guns. Like England, our mechanized equipment was almost nil. And yet, like England, we had voted what we considered to be large appropriations and we had felt perfectly secure. And, unlike Britain's leader, Stanley Baldwin, America's Roosevelt had been far ahead of public opinion in this country in his opposition to the dictatorship. Since his "Quarantine the aggressor" speech in 1937, he has introduced larger defense estimates than Congress was prepared to accept. In fact, his 1940 Naval appropriation was cut by over 500 million dollars not four months ago. I point this out as I wish to, show that we should not dismiss England's position as being merely a question of lack of leadership. Our leadership has been outspoken, yet our positions still show a remarkable similarity. 1946 - Elected to Congress, Democrat. 1952 - Elected to the Senate. 1953 - Married Jacqueline Bouvier. 1956 - Wrote Book: Profiles in Courage. 1957 - First child, Caroline. 1958 - Wrote Book: A Nation of Immigrants. The famous words of Emma Lazarus on the pedestal of the Statue of Liberty read: "Give me your tired, your poor, your huddled masses yearning to breathe free." Until 1921 this was an accurate picture of our society. Under present law it would be appropriate to add: "as long as they come from Northern Europe, are not too tired or too poor or slightly ill, never stole a loaf of bread, never joined any questionable organization, and can document their activities for the past two years." 1960 - Wrote Book: The Strategy of Peace. In the last several years, I have been serving as a member of the United States Senate, as a member of the Foreign Relations Committee, and as the Chairman of the Senate Foreign Relations Subcommittees on the U.N . and on African Affairs. Here, in these posts, the mechanical act of casting a yea or a nay vote is the least part of the work to be done. The greater part is the act of educating oneself about the play of forces which call for a yea or a nay decision; of sifting, defining, and choosing between alternative policies; and of explaining why this instead of that policy commends itself to one's reason. The statements contained in this volume represent my own attempt to make plain to myself and to others my thoughts on the leading questions of foreign policy that have borne down so hard on all of us. I do not claim to have all the answers. But Professor Allan Nevins and Harper & Brothers have very kindly asked to bring together some of my main addresses to the Senate and other public forums on foreign policy and related areas over the last several years. To these I have added my own current comments. 1960 - Won Presidential Election against Richard Nixon. Narrow margin. 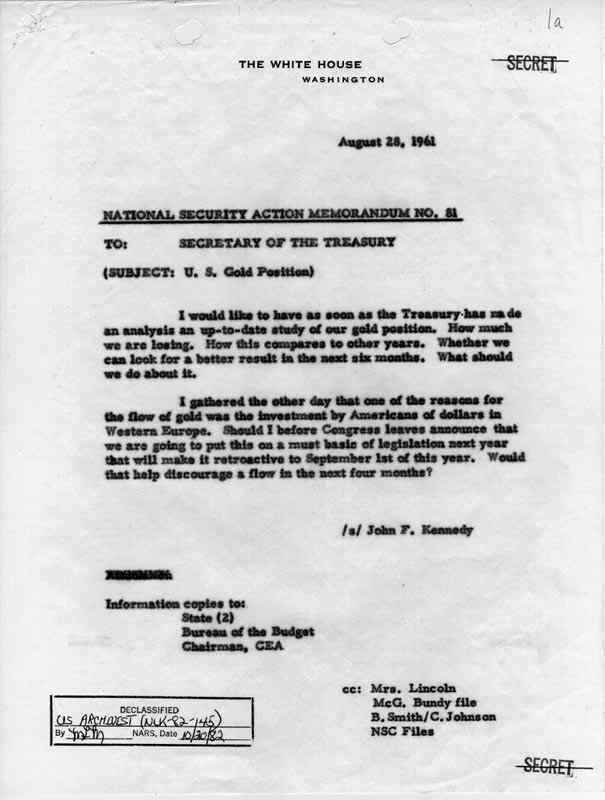 1961 Aug 28 - NSAM 81 - something's up with the Gold? 1961 - CIA Bay of Pigs Fiasco, Cuba. 1962 Autumn - Cuban Missile Crisis. Threat of World Nuclear War. 1963 Jun 11 - President mobilizes Alabama National Guard to admit two negroes to University of Alabama as ordered by the court. 1963 Jun 22 - President proposes most sweeping Civil Rights legislation in history to give all Americans equal opportunity in education, employment, public accommodations, voting and access to Federal programs. 1963 Jul 18 - President presents latest in series of administrative and legislative programs to stabilize United States balance of payments and stem outflow of gold. 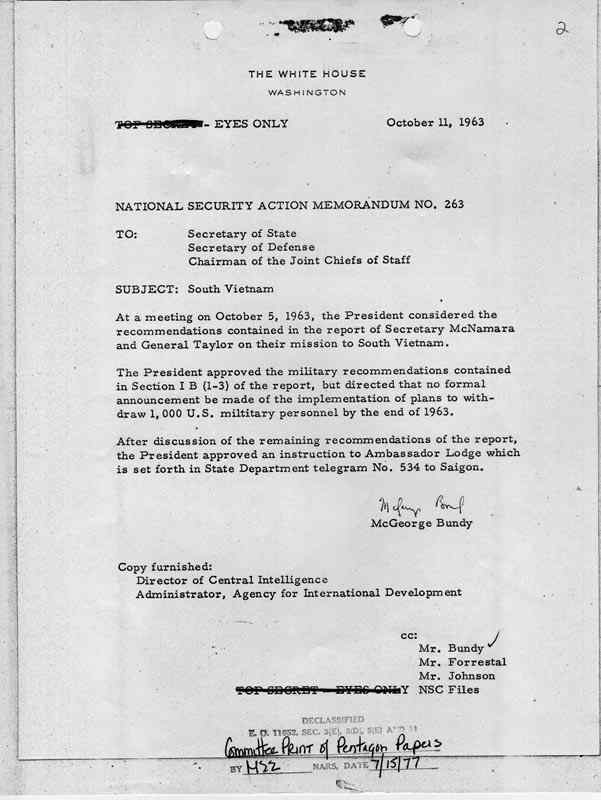 1963 Aug 11 - President issues NSAM 263 - start of withdrawl of military personnel from Viet Nam. 1963 Sep 20 - President, in address to the United Nations General Assembly, proposes additional cooperation with Soviet Union, including outer space exploration--United States and Soviet Union subsequently agree on outer space disarmament move. 1963 Nov 22 Friday - Died, Dallas, Texas. Note the man with the umbrella lowered (look just to the right of the arrow). 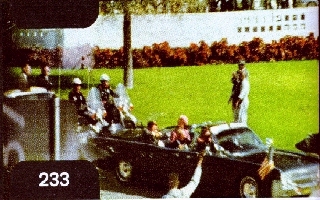 This is Willis#5 believed to correspond to Zapruder frame# 202. 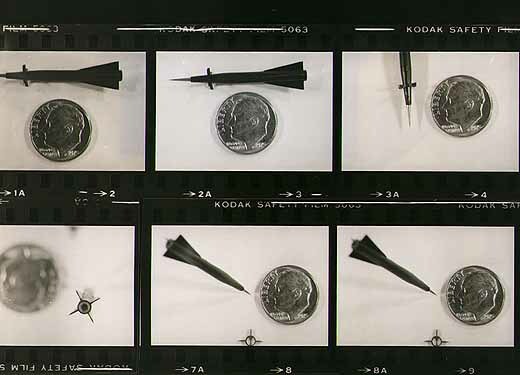 At about this time, the first shot from the 2nd Floor Dal Tex building has been fired but misses, passing over the heads in the Presidential Limozine. I believe shortly after this point, since the first shot missed, compromising the element of surprise, the black ops person with the umbrella fires a paralysing flechette to the front of the President's throat. 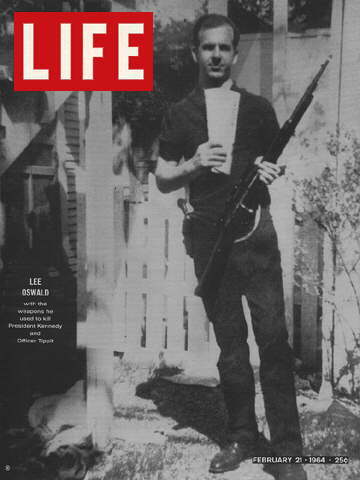 Note the raised posture of the Umbrella, and the position of The Umbrella Man relative to the Kill Zone (near Moorman and Hill). The black ops person has just used a flechette on the President and jerks the umbrella upward to activate the reload mechanism. Zapruder Frame 233 shows that the President is in trouble. His elbows are up and his hands seem to be grasping towards his throat. His wife Jackie is concerned as if to say "What's wrong honey?". The President hasn't been hit by a high speed rifle bullet. Note the UMBRELLA. Shortly after this point, the umbrella man will be facing the President's BACK, and will deliver a second flechette, which will produce the controversial shallow back wound. Head shot from the FRONT. It's that simple. 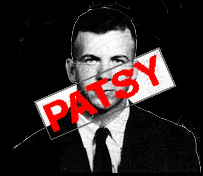 The preordained PATSY 24 year old former Marine. Was stationed at Atsugi base in Japan where he had knowledge of the U2 SPY plane. Had possession of a Minox SPY camera. Lived in the USSR for a few years, a few years which coincidentally included the time when Gary Powers' U@ SPY plane went down in the USSR.